Maha Ganesh represents the energy of Lord Siva and Goddess Parvathi (Uma). Because of a mythological incident, the normal head of Ganesha had to be replaced with that of an elephant. The elephant-headed Ganesha looks like OM, the pranava mantra, representing the quintessence of the Vedas (Hindu scriptures), indicating power and wisdom. 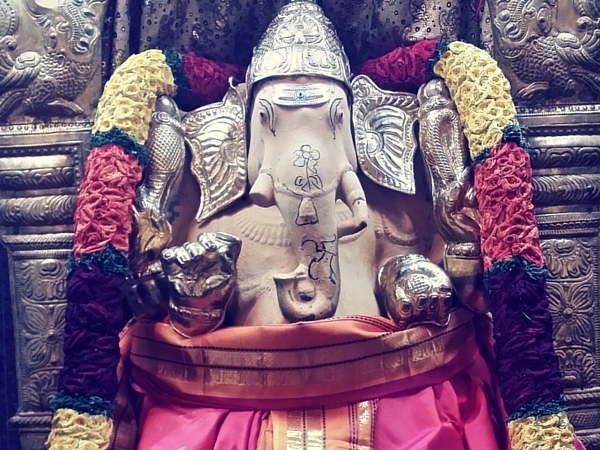 I salute the Lord Heramba (the self-effulgent Ganesha), the one who destroys all obstacles, who has a huge body, a face that of an elephant and only one tusk.